Coincidiendo con su estreno en cines, el próximo 5 de octubre se pondrá a la venta la banda sonora de A Star is Born (Ha nacido una estrella), el remake protagonizado por Lady Gaga y Bradley Cooper -quien en esta ocasión también ejerce como director y guionista-. Esta banda Sonora contiene 19 canciones interpretadas por los protagonistas con gran variedad de estilos y 15 cortes de diálogos, con los momentos que llevarán a los oyentes por un recorrido que refleja la experiencia de la película, siguiendo el romántico viaje de Bradley Cooper como Jackson Maine y Lady Gaga como Ally. La protagonista aspira a convertirse en una gran estrella, aunque está a punto de renunciar a su sueño de dedicarse a la música cuando Maine decide ayudarla en su carrera hacia la fama. Pero cuando por fin despega la carrera de la joven cantante, él deberá luchar contra sí mismo y sus demonios internos. El elenco de intérpretes lo completan Sam Elliott ('El gran Lebowski'), Andrew Dice Clay ('Blue Jasmine') y el comediante Dave Chapelle, entre otros. El filme supone el debut de Cooper como director y guionista. Eric Roth y Will Fetters han colaborado en la elaboración del libreto. El actor también ejerce de productor a través de su productora 22 & Green. Esta cinta sería el cuarto remake de 'Ha nacido una estrella', que en 1954 estuvo protagonizada por Judy Garland y James Mason, y dirigida por George Cukor. En 1976 Barbra Streisand y Kris Kristofferson interpretaban a la pareja central, dirigidos por Frank Pierson. 2. “Black Eyes” – Performed by Bradley Cooper. Written and produced by Bradley Cooper and Lukas Nelson. 5. “La Vie En Rose” – Performed by Lady Gaga. Written by Louiguy and Edith Piaf. Produced by Lady Gaga and Brian Newman. 7. “Maybe It’s Time” – Performed by Bradley Cooper. Written by Jason Isbell. Produced by Bradley Cooper and Benjamin Rice. 9. “Out of Time” – Performed by Bradley Cooper. Written and produced by Bradley Cooper and Lukas Nelson. 10. “Alibi” – Performed by Bradley Cooper. Written and produced by Lady Gaga, Bradley Cooper and Lukas Nelson. 12. 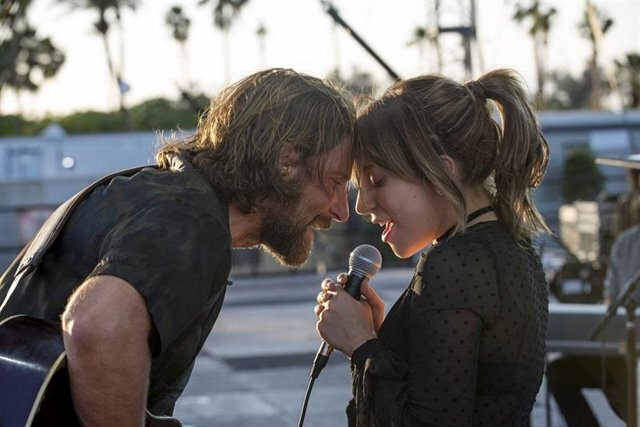 “Shallow” – Performed by Lady Gaga and Bradley Cooper. Written by Lady Gaga, Mark Ronson, Anthony Rossomando, and Andrew Wyatt. Produced by Lady Gaga and Benjamin Rice. 14. “Music To My Eyes” – Performed by Lady Gaga and Bradley Cooper. Written by Lady Gaga and Lukas Nelson. Produced by Lukas Nelson. 15. “Diggin’ My Grave” – Performed by Lady Gaga and Bradley Cooper. Written by Paul Kennerley. Produced by Lady Gaga and Lukas Nelson. 17. “Always Remember Us This Way” – Performed by Lady Gaga. Written by Lady Gaga, Natalie Hemby, Hillary Lindsey, and Lori McKenna. Produced by Dave Cobb and Lady Gaga. 20. “Look What I Found” – Performed by Lady Gaga. Written by Lady Gaga, Mark Nilan Jr., Nick Monson, Paul “DJWS” Balir, Lukas Nelson, and Aaron Raitiere. Produced by Lady Gaga, Mark Nilan Jr., Nick Monson, and Paul “DJWS” Blair. 22. “Heal Me” – Performed by Lady Gaga. Written by Lady Gaga, Mark Nilan Jr., Nick Monson, Paul “DJWS” Blair, Julia Michaels, and Justin Tranter. Produced by Lady Gaga, Mark Nilan Jr., Nick Monson, and Paul “DJWS” Blair. 25. “Is That Alright?” – Performed by Lady Gaga. Written by Lady Gaga, Mark Nilan Jr., Nick Monson, Paul “DJWS” Blair, Lukas Nelson, and Aaron Raitiere. Produced by Lady gaga, Mark Nilan Jr., Nick Monson, and Paul “DJWS” Blair. 27. “Why Did You Do That?” – Performed by Lady Gaga. Written by Lady Gaga, Diane Warren, Mark Nilan Jr., Nick Monson, and Paul “DJWS” Blair. Produced by Lady Gaga, Mark Nilan Jr., Nick Monson, and Paul “DJWS” Blair. 28. “Hair Body Face” – Performed by Lady Gaga. Written and produced by Lady Gaga, Mark Nilan Jr., Nick Monson, and Paul “DJWS” Blair. 30. “Before I Cry” – Performed by Lady Gaga. Written and produced by Lady Gaga, Mark Nilan Jr., Nick Monson, and Paul “DJWS” Blair. 31. “Too Far Gone” – Performed by Bradley Cooper. Written and produced by Bradley Cooper and Lukas Nelson. 33. “I’ll Never Love Again (Film Version)” – Performed by Lady Gaga. Written by Lady Gaga, Natalie Hemby, Hillary Lindsey, and Aaron Ratiere. Produced by Lady Gaga and Benjamin Rice. 34. “I’ll Never Love Again (Extended Version)” – Performed by Lady Gaga. Written by Lady Gaga, Natalie Hemby, Hillary Lindsey, and Aaron Ratiere. Produced by Lady Gaga and Benjamin Rice.